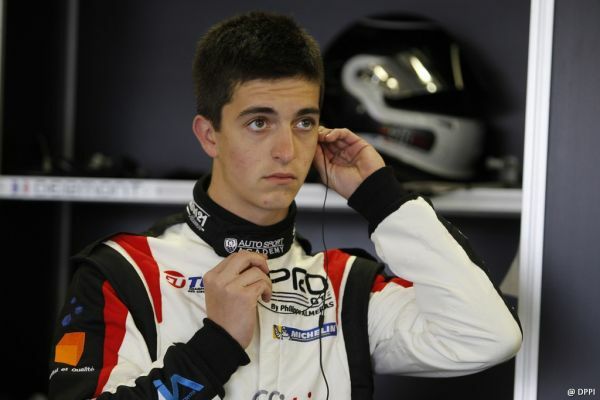 For his debut in the French FFSA GT Championship, the “Volant Euroformula” 2012, Enzo Guibbert, made it to the second step of the podium in his second race after he finished ninth in Race 1! Behind the wheel of his Porsche 997 GT3-R managed by Philippe Alméras, Enzo outwitted all the traps and climbed level with the best. Enzo Guibbert showed his promise from the first free practice where he made second best time before qualifying in eighth position despite losing some time because of the traffic in his fast lap which prevented him from qualifying higher. For Race 1, his co-driver, Eric Dermont, ran a good relay before handing the wheel over to Enzo Guibbert mid-race. But two laps later the rain appeared bringing with it the safety car which did not do Enzo and his team any favours. The race was restarted for two laps during which the “Volant Euroformula” overtook three cars to finish ninth in a race that was cut short. For Race 2, it was Enzo Guibbert’s turn to take the start but, from the second lap, the safety car appeared again due to an accident. The Pro GT team opted for an aggressive strategy by quickly taking to the pits which allowed Porsche N°2, driven by his co-driver Eric Dermont, to take the race lead. “If our objective was to reach a podium, then to make it happen confirms that we had worked well all weekend and that I had improved in all domains. I was just as comfortable in the rain as I was on dry which is promising for the future because I can only get better. Enzo Guibbert will take part in a day of tests on May 2 before the next challenge of the French FFSA GT Championship which will take place on the Imola circuit in Italy on May 18 and 19. Considering how competitive he is, the “Volant Euroformula” should be playing lead roles. Pegasus Racing - Le bronze à Estoril… et l’argent au championnat ! Pegasus Racing,Une éclaircie pour les Bleus sous le déluge !